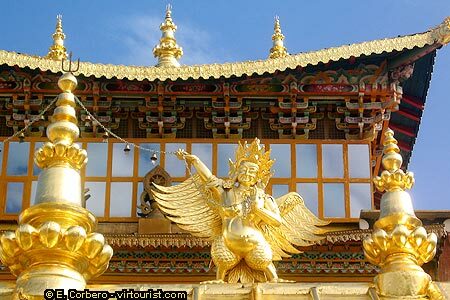 At the top of the main building there is a gilded copper roof inspired by the Potala Monastery in Lhasa. This part of the building has a clear Tibetan influence, but other parts have a Han Chinese influence. From the roof of this building there is a nice view of the Shangri-La town and valley.